The M/V Amatista was designed with the Amazon Jungle in mind. 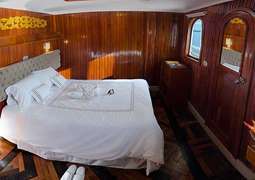 The ship offers all of the comforts needed while still allowing for adventures to the Amazon Jungle. The M/V Amatista offers 15 cabins. Each cabin offers spectacular views of the Amazon River. All rooms offer air conditioning. Each cabin also contains a private bathroom. Different cabin options such as double or twin cabins are available, depending on your needs and preferences. There is also one triple cabin available. As you dine onboard the M/V Amatista you have the possibility to enjoy both international and local cuisine. Guests can also find a fully equipped bar on-board. You will never be short of activity while on board the M/V Amatista. Guests can enjoy fantastic views of the Amazon Jungle as well as many excursions. There is also a lounge and reading room which offer the perfect opportunity for some downtime.